We revisit the sequential search problem by Hey (J Econ Behav Organ 8:137–144, 1987). In a 2 \(\times \) 2 factorial design, varying fixed and random cost treatments with and without recall, we address open research questions that were originally stated by Hey (1987). Our results provide clear evidence for Hey’s (1987) conjecture that recall negatively affects performance in sequential search. With experience, however, search behavior with and without recall converges toward the optimal reservation rule. We further find that the utilization of optimal reservation rules is independent from the stochastic nature of the search cost. The online version of this article (doi: 10.1007/s11238-014-9444-1) contains supplementary material, which is available to authorized users. Financial support by the University of Luxembourg is acknowledged (F2R-LSF-POL-09BCCM). (F2R-LSF-POL-09BCCM), and by the Fonds National de Recherche Luxembourg (F2R-LSF-PMA-13SYSB). This research was inspired by John Hey’s excellent research and by the insightful discussions with him in our many years of academic interaction. We also acknowledge helpful comments by the editor, two referees, and participants at the Durham workshop in honor of John Hey. Di Cagno, D., Neugebauer, T., Rodriguez-Palmero, C., & Sadrieh, A. (2014). Recall searching with and without recall. 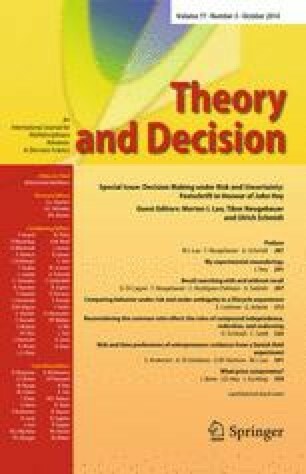 Online resource at http://ideas.repec.org/p/jau/wpaper/2014-14.html and University of Luxembourg (http://wwwen.uni.lu/recherche/fdef/luxembourg_school_of_finance_research_in_finance/working_papers).